Bear with me while I vent a little. There are lots of important things to ponder: the origins of the universe, the possible effects of climate change, the meaning of reality TV; but sometimes I take a little break and think about lesser issues. 1. I take my reusable bags to the grocery store to avoid plastic bags. Why do they insist on putting every package of meat in a separate plastic bag anyway? I know the excuse is to avoid cross-contamination. But have you looked at a meat counter? Most of the stuff in there is fresh meat combined with fruit, vegetables, stuffing--everything else you find in the grocery store except maybe fish food and tabloids. Isn't that cross-contamination? 2. In the midst of all the flash-flooding in the Midwest, why haven't the powers that be resurrected the old punishment that was meted out for adultery in the seventeenth century? People who insist on driving on a flooded road and then have to be rescued, requiring resources legitimately needed elsewhere should have an "S" branded on their foreheads for "Stupid" or "Self-centered." 3. Why is a golfer allowed to use more than one club? I think a club could be devised that would work for all shots. It might be more of a challenge, but how could that be bad? Tennis players don't switch rackets between shots. Are football teams allowed to use a different ball for a kick than a pass play? I have a theory on this one: it would put caddies out of a job and make golf cheaper to play and thus more open to the unwashed masses. It is the only sport in our local school where kids have to provide their own equipment. Since between the rain and the heat I can't get much done outside, as in camping, gardening, painting, etc., I am making better progress on the third book in the Frannie Shoemaker Campground Mystery series, Peete and Repeat. It takes place in an area of southeastern Minnesota, based on Lanesboro and the Root River Bike Trail, and was inspired by the old Root River Power plant, abandoned in 1928 and pictured at left. Doesn't it just scream out "Spooky'? And if there's an old tunnel leading to it through the bluff, even better? Frannie and her friends encounter Valerie and Virginia Peete, identical twins; a wannabe country star; a seedy clan possibly involved in making meth; a two-timing stockbroker; and a grouchy learning center receptionist; among others. In addition, Frannie's investigating powers are severely hampered by sore ribs from a fall. I could tell you more but I don't even know for sure what's going to happen. Stay tuned. PS-I have two giveaways going on right now of signed copies of The Blue Coyote--one on Goodreads and one on this site under 'Giveaways and Stuff.' Don't miss out. Giveaway ends July 10, 2013. 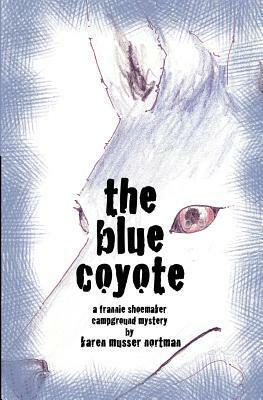 As a sacrifice to the camping gods to encourage better weather, I'm giving away four signed copies of The Blue Coyote this month. Go for it! Oh, and I would much appreciate reviews on Amazon and Goodreads. Thanks! We have visited the Root River area of Southeastern Minnesota before, always involving canoeing and camping. But Frannie and her friends will next be visiting a similar area so this trip had a serious purpose and turned out to be fun! In trying to learn more about the old 1915 power plant that clings to a 200 foot bluff along the river, we visited the Eagle Bluff Environmental Learning Center, which has sat on the top of the bluff for the last thirty years. What an amazing place and people were so helpful. They have day and resident programs for schools, team building for corporations, summer camps, and almost any other configuration you can dream up. When we were there, a sixth grade class was experiencing one of three high ropes courses (pictured). Those ropes are about 35 feet up and the students walked on single ropes and logs, guided by other ropes. I don't think Frannie will try it but Ben and Nancy might. Then, killing time waiting for the museum in Lanesboro to open, we drove through Fountain and stopped at the Fillmore County Museum there. It holds a great collection of things, wonderfully displayed. Especially for Butch, there are several Pietenpol aircraft, known as AirCampers, there. Back to Lanesboro, with a quick stop on the way at an herb farm, and lunch at the Spud Boy Diner, the only wood diner in the country still on its wheels. At the Lanesboro museum, I was able to look at a number of photographs of the power plant and the accompanying 1700 foot tunnel that goes through the bluff, thanks to a local historian, Don Ward, who has organized photos, newspaper articles and other documents into dozens of notebooks which makes reference so much easier. I found what I was looking for in a notebook labelled "Construction Before 1950." We finished off a day well-spent with ice cream, t-shirts, and supper at the Pedal Pushers' Cafe. It is very disconcerting to run into a character one has created in a restaurant. We are in Lanesboro, Minnesota doing a little research for Frannie's next adventure. We were having a wonderful supper last night at the Riverside on the Root and there was Jane Ann, having supper with a man who certainly wasn't Mickey. They told the waiter they were from Norway. Whatever. We spoke to the briefly as they were leaving but I didn't tell her that her name was really Jane Ann. Today we will check out the old Power Plant and the environmental learning center--key locations.